Indianapolis Colts Week 13: Back On Track? After what was a dismal showing on Thanksgiving against the Pittsburgh Steelers, the Indianapolis Colts hit the road to take on the New York Jets at MetLife Stadium on Monday Night Football. After missing the team’s Thanksgiving game against the Steelers while in the NFL’s concussion protocol, Colts quarterback Andrew Luck returned in a big way on Monday night against the Jets. Luck’s big day helped get the team back on track, as the Colts would take a blowout victory over the Jets, 41-10. With the Houston Texans’ loss to the Green Bay Packers on Sunday, there is a three-way tie for first place in the AFC South between the Texans, Colts and Tennessee Titans. With two victories over the Titans and a divisional matchup against the Texans looming, the Colts officially control their own destiny when it comes to winning the division and making the playoffs. It's a final at Lambeau. If Colts win tomorrow, you've got three 6-6 AFC South teams with 4 games left in the season. The Colts head home for Sunday’s BIG divisional matchup against the Houston Texans, with the winner of this game most likely to win the division and a spot in the playoffs moving forward. Don’t leave your tailgating plans to the cold. 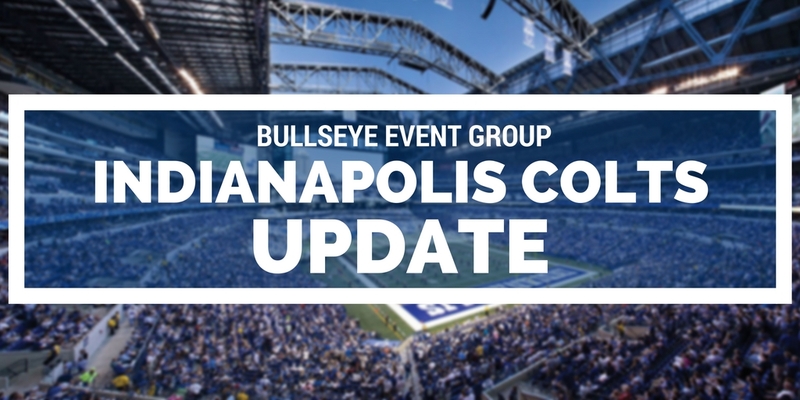 Enjoy the warm indoor atmosphere of the Colts VIP Tailgate for the December 11 game vs. the Houston Texans! A big divisional matchup looms at home for the Colts as they look to close the gap on the AFC South title. Get your Colts VIP Tailgate or Tailgate+Ticket Combo Packages today!